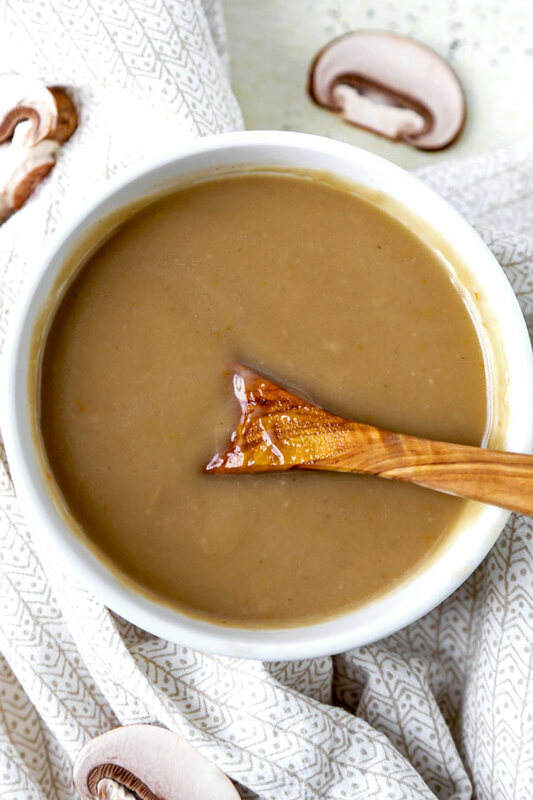 You’re going to love this easy Vegan Mushroom Gravy Recipe! All the savory flavors of a classic gravy, but 100% plant based. Ready in 20 minutes from start to finish! I’m addicted to French fries. Yep. This affliction hit me hard. Seriously, I can’t go more than a few days without caving in and making a huge batch of fries. While I realize that I have to take partial ownership for my fried potato dependence, it’s not all my fault. More specifically, I blame Quebec. You see, every time we visit Caroline’s friends and family in Montreal, I EAT POUTINE LIKE IT’S MY JOB. For the uninitiated, poutine is a simple, perfect trinity of ingredients: French fries and cheese curds smothered in savory brown gravy. Sounds pretty pedestrian, right? But it’s one of those deceptively perfect things in the food world. Much like slices of pizza to a New Yorker, poutine is that awesome utility food, great for lunch or a boozy late night snack in Montreal. And it’s got the hooks in me. Actually, poutine is the one reason I will probably never be able to call myself a true vegan. Because, although the lion’s share of my diet is plant based, there’s still the cheese curds and gravy I can’t ignore. Since (good) cheese curds are a little hard to come by in Brooklyn, I’ve taken to eating my fries alone with gravy. It’s a delicious combo. Hey, I know you know what I’m talking about. She had been working on a clandestine vegan gravy experiment – and wanted my input. The moment I tried a savory, velvety spoonful of her vegan mushroom gravy, I knew that this was the future for me and my French fry addiction. I know what you might be thinking… seriously – how good can vegetarian gravy actually be?? Well, I was right there with you until I tried this impossibly savory mushroom gravy. However, the key is science. You see, mushrooms are absolutely loaded with earthy umami flavor properties. 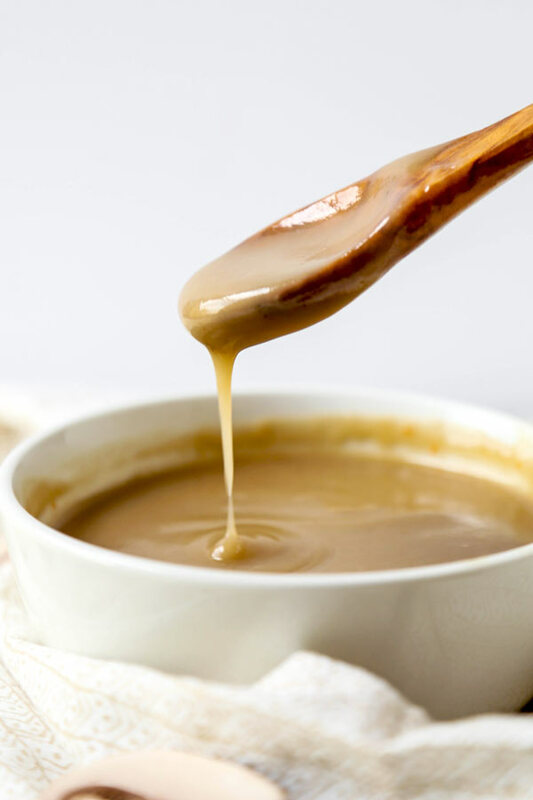 And it turns out that umami (the elusive Japanese fifth taste) is also present in things like cooked meats and meat based broth – which subsequently are the very things used to make traditional gravy. So the flavors in this vegan mushroom gravy are deep and homey, but don’t rely on meat to get there. It’s absolutely satisfying, and 100% plant based. Therefore, I’m guessing it may surprise you that there are no actual mushrooms in this easy vegetarian recipe. That’s right, the heavy lifting in this mushroom gravy is done by using broth. Mushroom broth has the distilled essence of mushrooms at its core. So, while you could steep your own dried mushrooms for hours at home – you can also just pick some broth up at the grocery store and get right to work. The end result is a thick, smooth mushroom sauce that tastes like a cross between a savory golden mushroom soup and a classic beef gravy. So, how easy is it to make? Well, when Caroline showed me how to make this easy vegan mushroom gravy (yeah, I learned how to do it on my own, because fries), I was shocked at how dead-simple it was to make from scratch. 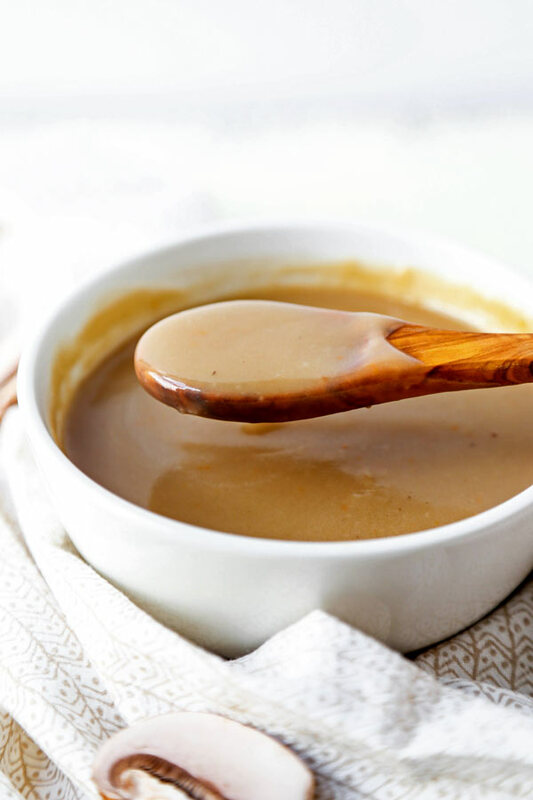 Wanna learn how to make homemade gravy? Wanna keep your mushroom gravy vegan? Turns out those two things aren’t mutually exclusive. So, follow along! In a pot over medium-high heat get two tablespoons of extra virgin olive oil and two tablespoons of vegan butter going. Once the vegan butter has melted, add a small chopped onion, a small chopped carrot and a stalk of chopped celery to the pot and cook for about 10 minutes or so – until the veggies have softened. 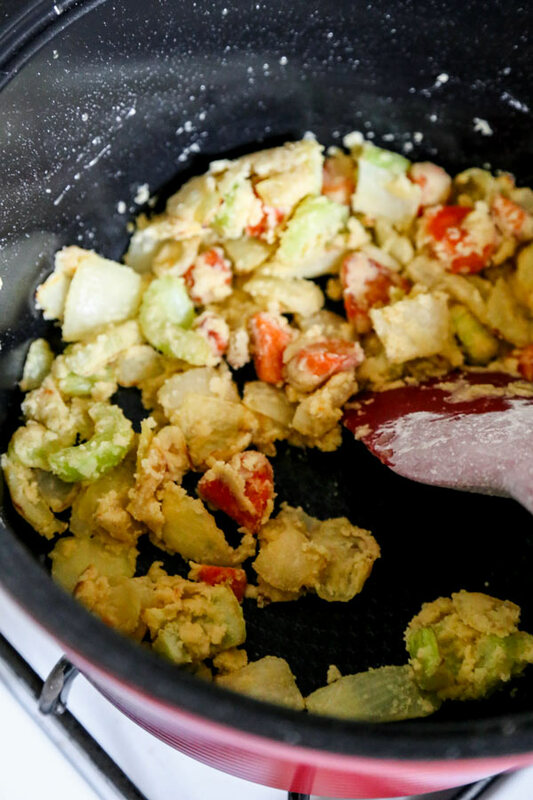 Now, slowly sprinkle a half-cup of all purpose flour over the veggies as you stir. Once you’ve added it all, stir the mixture constantly for 3-4 minutes until your flour is golden brown. At this point, whisk in 4¼ cups of mushroom broth, 1½ tablespoon of soy sauce, ½ tablespoon of mirin and a pinch of kosher salt. Bring to a boil and stir occasionally for 3-4 minutes. Then simply grab a mesh strainer and strain your gravy into a serving container. The resulting vegan mushroom gravy is smooth (lump-free, yay!) and ready to serve. And aside from the umami deliciousness, I think you’ll also love how versatile it is. What does this vegan mushroom gravy recipe go with? Sure, this is an amazing mushroom gravy for mashed potatoes. And French fries. Seriously, poutine will never be the same for me. I have found my gravy muse. Hmmm… kinda weird that I said that, right? 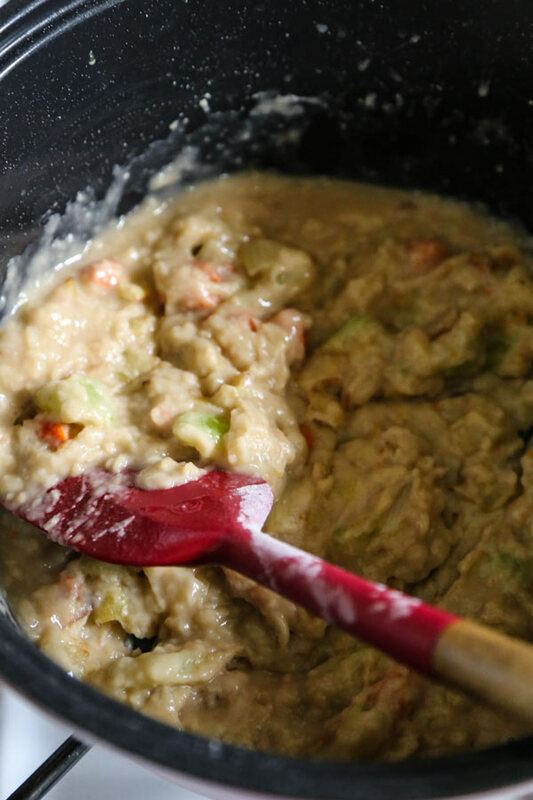 Anyway, you could enjoy this vegan gravy with something super healthy like low-carb cauliflower mashed potatoes – or something more indulgent like another French Canadian classic… tourtiere. To be fair, the possibilities are pretty endless. What will you put this vegan mushroom gravy on in your house? Let us hear about it in the comments! As the holidays approach, a ton of people are probably getting ready to fix up feasts for their families and closest friends. There’s nothing better than breaking bread with your besties – and maybe passing out in front of a football game afterwards. I’m a big sucker for Thanksgiving. Always have been. These days, it’s pretty common to have a vegetarian or vegan coming to dinner. There may be a few panicked Google searches in the weeks leading up to Thanksgiving like… Can vegans eat gravy? Don’t worry! The answer is yes (and the recipe is below). Well, I’ve made Caroline’s recipe twice now. Yes. Both times with French fries. And, I’ve gotta tell you, I’m smitten. This savory mushroom gravy recipe isn’t one of those vegan recipes that’s close enough to the original that it’ll do. Nope. 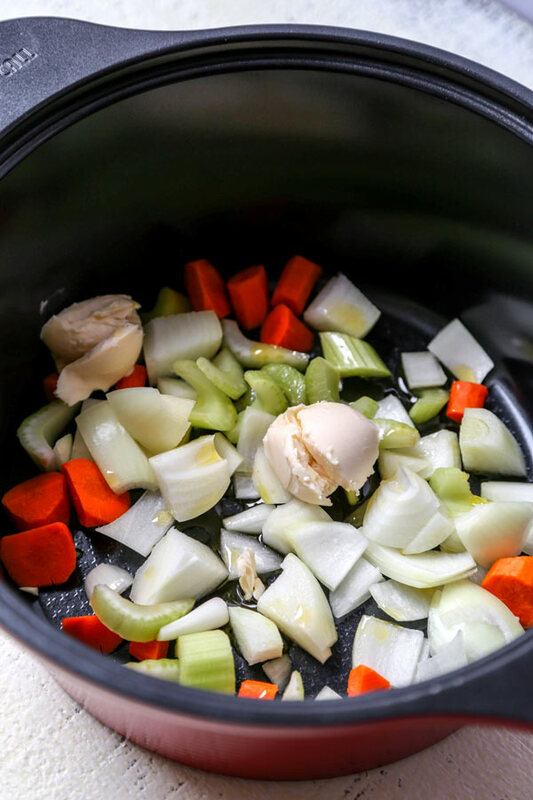 This is a full flavored recipe that is practically indistinguishable from mom’s homemade pot roast gravy. The deep, rich flavor and velvety texture are there. So make it with confidence. 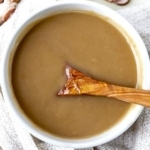 Did you like this Vegan Mushroom Gravy Recipe? Are there changes you made that you would like to share? Share your tips and recommendations in the comments section below! An easy Vegan Mushroom Gravy Recipe with all the savory flavors of a classic gravy, but 100% plant based. Ready in 20 minutes. In a pot over medium high heat, add olive oil and vegan butter. 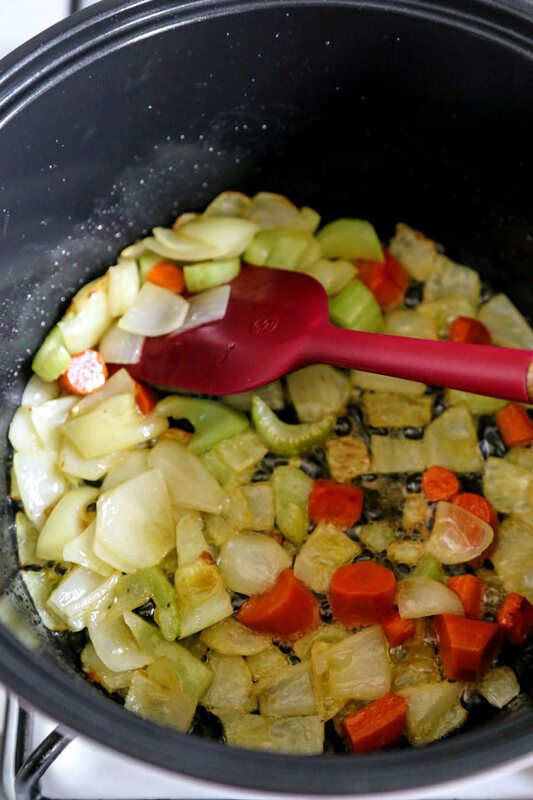 When the butter has melted, add onions, carrots and celery, and cook for 8-10 minutes, until vegetables are tender. Sprinkle flour, and stir constantly for 3-4 minutes, until the flour is golden brown. Slowly whisk in mushroom broth, soy sauce, mirin and salt, and bring to a boil. Boil for 2-3 minutes, stirring occasionally. Turn the heat off and pass through a fine mesh strainer. Discard the veggies. Serve. 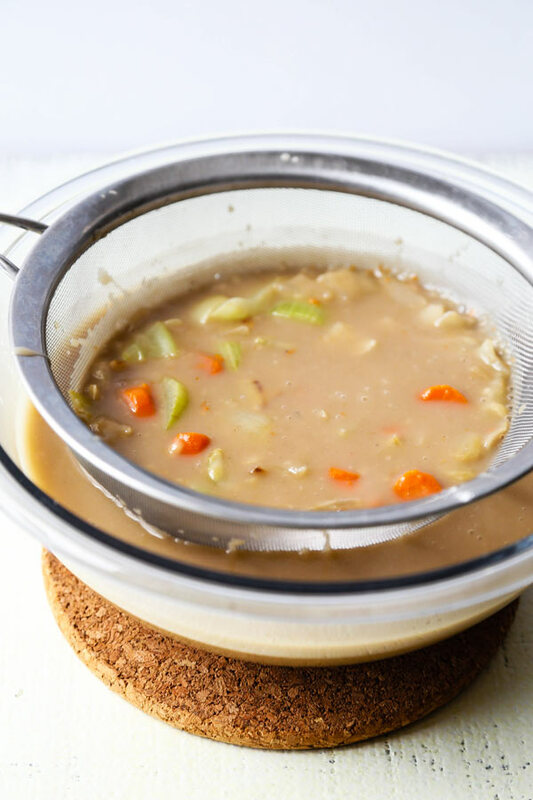 You can store leftovers of this vegan mushroom gravy in the fridge for 5-7 days.